Clio founders Rian Gauvreau and Jack Newton. I am just back from ABA Techshow in Chicago. It was well worth the trip, with great programming, a teeming exhibit hall, and abundant opportunities for networking and socializing. The one question I was most often asked there (and that I most often asked others) was, “What have you seen that is new and interesting?” Here are my top 10 picks. 1. Clio: A $20 million investment. Strictly speaking, this was old news, in that it was actually announced a few days before Techshow. Even so, it seemed to be the talk of the show. After all, it’s not every day you see a $20 million investment in a legal company – let alone a legal-industry start-up (if it can still be called that after six years) in the still nascent field of cloud-based practice management. What does this mean for Clio? What does this mean for other practice-management vendors? And what does this say about how hot or not the legal industry is in general? Clio’s new-found capital had people at Techshow asking those questions and many others. 2. Worldox/Sony: Digital paper meets document management. Sony Electronics and Worldox teamed up to preview an intriguing new digital paper device from Sony as well as an intriguing new partnership between the two companies. The device will integrate with the Worldox document management system and Worldox will be the device’s exclusive U.S. distributor. Sony’s Digital Paper is a remarkably thin (.26 inches) and light (12.6 oz.) tablet-like device with a 13.3 inch, high-contrast E Ink display. 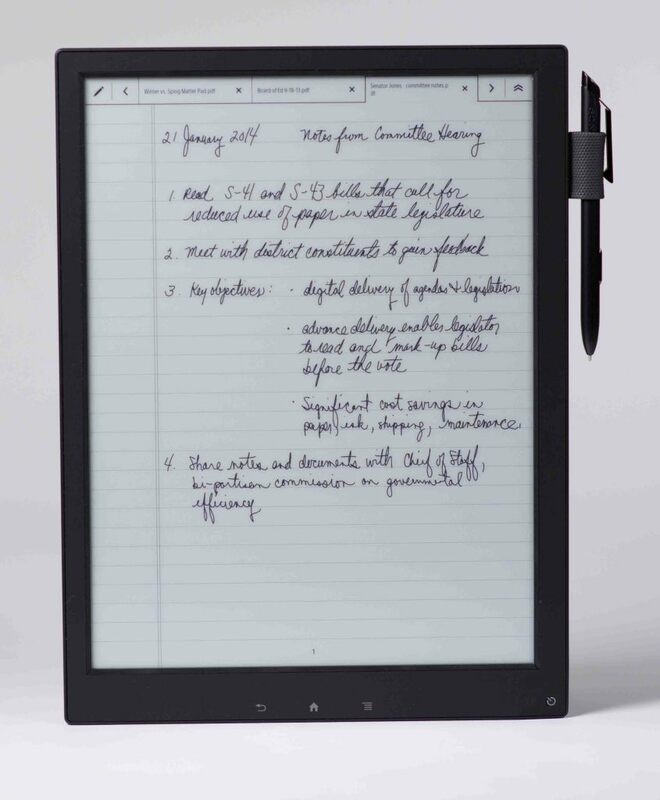 Use it to take handwritten notes or to read and annotate documents. I tried a preproduction model and found the note-taking to be almost like writing on actual paper. When the device becomes available in May, it will fully integrate with Worldox so lawyers can access and save documents and handwritten notes. The device will initially be available only through Worldox, at an expected list price of $1,100. Watch this blog for more details. 3. MyCase: Enhanced document management. MyCase demonstrated a document management system it will be rolling out sometime in the next three weeks or so. Based on what I saw, it is as close to a full-featured DMS as you will find integrated within a cloud practice management platform. It uses folders, not tags, to organize documents. It automatically creates a folder for every new case, plus you can create as many custom folders and subfolders as you like. Any folder can be shared with colleagues or clients, enabling all the documents within it to be shared. The system has full drag-and-drop functionality, so both folders and files can be moved simply by dragging and dropping. Although described as a document management system, you can store any type of file here. MyCase also unveiled its new Android app at Techshow. 4. CaseTrek: Practice management with integrated metrics. File this under one to watch. CaseTrek is yet another entrant in the burgeoning array of practice-management applications. It is not yet available and probably will not be until later this year (although you can sign up for a beta invite). However, based on a development version I saw demonstrated at Techshow, it has two built-in features that could differentiate it from similar platforms. One is a metrics dashboard that can be used to gain insights into productivity, billings and practice areas within your firm. The other is process management using custom matter-type templates that can be used to automate the setup of tasks and deadlines for specific types of matters and cases. 6. 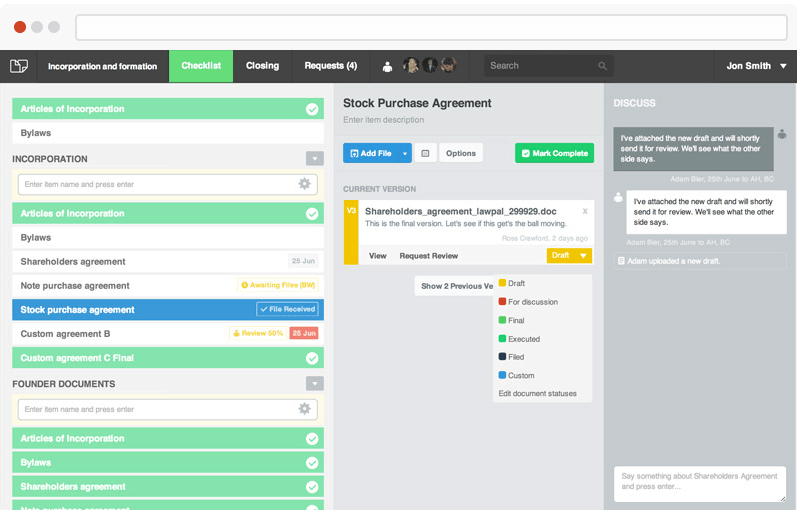 LawPal: Simple project management. LawPal started out to be a different company, one that matched lawyers and clients. But when its founder Yael Citro, a former corporate lawyer, went through the process of closing the company’s initial seed round, she was surprised by the inefficiency of the process. Her team built its own project management tool, and the response from the lawyers who tried it led the company to change course and focus on the tool as its product. Officially launched at Techshow, LawPal is a simple and — dare I say it — elegant platform that is part deal room, part project manager. It is a cloud-based workspace for planning, executing and tracking a transaction, allowing lawyers and clients centralized access to all documents, communications and notes. 7. LexisNexis Firm Manager: Finding forgotten money. Are you letting money fall through the cracks by neglecting to bill all your work? Firm Manager wants to help you find all that lost money. 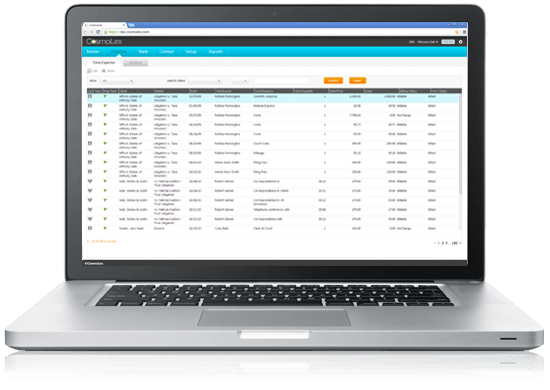 Its new feature, called Money Finder, automatically searches through all your Firm Manager tasks, meetings and documents and flags any it finds that have not been associated with a client bill. You can then review each flagged item and decide whether it should be billed. 8. LawToolBox: Integrating deadlines with Microsoft. 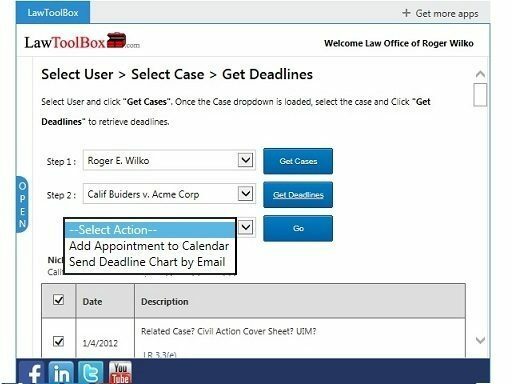 Last year, I reviewed LawToolBox, a cloud-based deadline calculator for state and federal courts. As I noted then, a nice feature of LawToolBox is that it can be integrated with Microsoft Outlook, so that deadlines and notifications appear there. At Techshow, LawToolBox announced two new apps that integrate its deadlines within Office 365 for Legal and Windows 8.1. The Office 365 app works with Outlook 2013 and Outlook 365, allowing users to retrieve and email deadline charts for any of their cases; generate and email date-range reports of upcoming deadlines by attorney, practice area or group calendar; and import deadlines into their Outlook calendar. The Windows app lets users access their case deadline charts from any Windows 8.1 device. 9. TheFormTool: A guaranteed boost to your bottom line. The folks at TheFormTool must be pretty confident about their document automation system Doxsera 2.0. At Techshow, they announced that they are offering a results guarantee for lawyers, law firms and legal departments. Their guarantee is that Doxsera will reduce total costs by at least 13 percent and increase income by 11 percent or more in its first year of use. 10. JuraLaw: Integration with NetDocuments. JuraLaw, a cloud-based case, calendar and docket management system, announced that it now integrates with the NetDocuments document management system. The integration allows JuraLaw users to associate documents stored in NetDocuments to cases, dockets and diary events in JuraLaw. The integration works in real time, so documents can be linked to JuraLaw as they are added to NetDocuments.